Will cause creaking after time! I got tired of buying replacement Shimano bottom brackets, as they don't last long. I bought this kit as it looked enticing and seemed to offer a long term solution (better shields and better bearings). In order to install this kit you'll need a bearing puller/press kit (or be a really crafty machinist to carefully press the new bearings in on the outside race only). I got around 1,500 miles of use out of this kit before it started creaking. I disassembled the crank, regreased everything, and the creaking stopped temporarily. Over the next 1,000 miles the creaking kept coming back. After the fourth removal and regreasing over these 1,000 miles, I had enough and put a new stock Shimano BB back on. Effectively the problem is this bearing kit creates a metal-on-metal contact with the crank spindle. It removes those plastic bushings, which means the bearings sit directly on the spindle. Everyone knows the problem with BB30 is that they start creaking after a while because it is metal-on-metal, and this kit effectively does the same thing to your 24mm spindle Shimano crankset. There is a reason Shimano still uses those plastic shims on their bottom brackets!!! It is to stop the creaking! It's a great concept, but didn't work for me. I supposed you could try and use something like Loctite #620 Retaining Compound between the bearings and crank spindle, which is made specifically for this metal-on-metal purpose to improve tolerance fit, but it would probably be a pain to remove. Given genuine Shimano BB's are the same price as this kit, just buy a replacement Shimano BB. Does not fit GXP or Sram BBs as implied in the product description. These need a different Non Drive Side bearing. Does fit most other external bearing BBs. With careful use of conventional tools it is easy to change the bearings in the threaded cups. I read from other comments this is for Shimano which I have. I called asking if the bearings were ceramic as the picture and description shows. The Jenson rep said he would go to the warehouse and check. He then told me yes they are ceramic. I bought the kit and they arrived NOT ceramic but still a fair deal for the Shimano kit. Not sure why Jenson does not update the description? not sure if the description has been updated after the negative comments about not fitting SRAM. its clear they are for shimano/RF/FSA and these bearings fit their external cups perfectly. 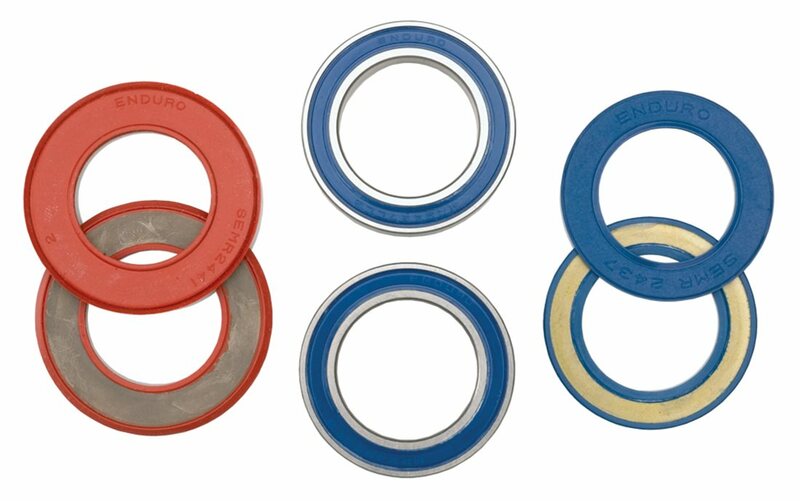 you will need a bearing puller and press or get inventive to install them but if you have the tools and know what you are doing these are the longest lasting reasonably priced bearings available. my experience is these bearings last 2-3 times longer than the stock shimano bearings. they don't last forever but no BB will and the price is more than reasonable. Not the right product description!! This is for SHIMANO, not SRAM.